My initial experience with Eagle Rock standout The Oinkster was something of a disappointment, but also something of a fluke. My esteemed associate Bill has since returned more than once, highlighting some of the things on offer at what is, by nearly all accounts, an outstanding sandwich shop. I found myself there recently and was able to sample some of those things, and I came away as delighted as anyone. I’m not breaking any new ground in praising the Oinkster, but I do believe the sandwich shop is a special thing and it deserves to be recognized as such. I’ve discussed this before, how many places sell sandwiches but the Sandwich Shop is a different thing entirely, and a good one is to be treasured. 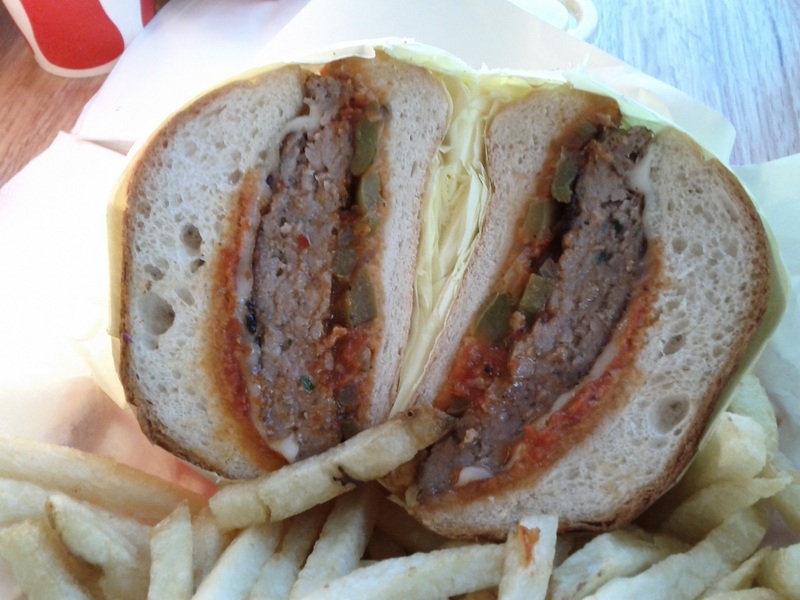 The above sandwich was their special of the moment, a pork patty grilled and put between bread with provolone, peppers and onions, and marinara. There’s not much to complain about there, the pork was moist and tasty, the flavor combination tried-and-true. The Oinkster sells a burger called The Royale, and it’s piled high with chili, bacon and pastrami. So I’m not sure if I can call the above Oinkster Pastrami the intended ne plus ultra of the menu, it shares the shop’s name and is built to highlight the pastrami upon which they pride themselves, but it isn’t listed first on the menu and it doesn’t carry the same mien that featured sandwiches from other establishments do. None of that has any bearing on its quality, I suppose, and it’s quite good. 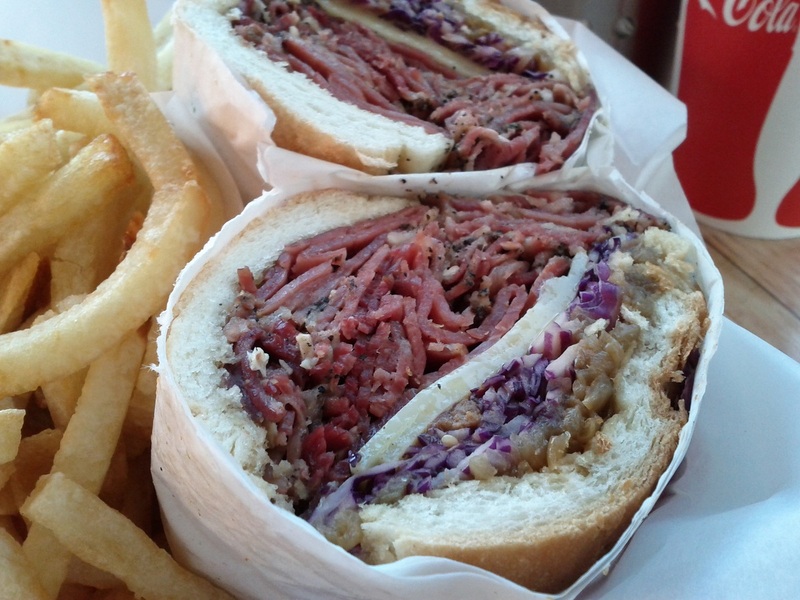 It’s pastrami, cabbage, grilled onions and Gruyere cheese. That’s tasty, and it’s presented in reasonable proportion, but I think the cheese gets a bit lost. Regardless, it’s tasty as heck and a reasonable contender in a town where “best pastrami” is no small contest. This entry was posted in Sandwich Reviews and tagged Eagle Rock, Los Angeles, Pastrami, Pork, Reviews by Pete, Sandwiches I Have Eaten, Sandwiches Made For Me, The Oinkster by Pete. Bookmark the permalink. After all this time, I still think the best sandwich at Oinkster is just the plain pastrami (because the meat is so good) on their roll. Nothing more, nothing less. Where would you place it in the rankings of Los Angeles Pastrami? I find it to be much better than your average, but still below Canter’s. Haven’t really had as much of an opportunity to sample Langers & other heavyweights as I would like.